There's always been that special something that has drawn people to Łódź. For people like filmmaker David Lynch, it was the city's film-making credentials which drew him here, the town's old facades adding a charm like no other city. Then there were those seeking out industrial heritage or historical family connections - this is a city which always had something for everyone, however, the city itself up until recently suffered from a bad reputation, mostly amongst Polish people themselves. There was a post-industrial slump when large factories shut down and/or relocated. Unemployment rates shot up, as did all the other negative statistics that go hand-in-hand with a city's decline. The local authorities knew they needed to change things. And change is exactly what they have been undertaking in the last decade through a big urban regeneration plan, which of course, is still ongoing. In this very guide, we've praised the virtues of the transformation of Manufaktura of EC1 and a whole host of museums, but there's an unsung element, which can be often overlooked, but in equal measure brings people to this city, the aim to explore, to stare up at buildings – we are, of course, referring to the city's big collection of street murals! And who do we have to thank for that? The Urban Forms Foundation! 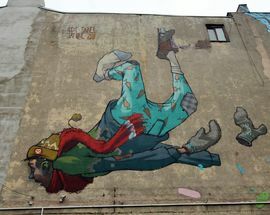 Created in 2008, Urban Forms took its tentative first steps, and started work in 2009, which eventually led to Łódź's very first street art festival in 2011. In such a short time, a whole host of international artists from Spain's ARYZ, Brazil's OS Gemeos, China's DALeast, and national artists such as M-City, Raspazjan, Mona Tusz have splashed their creativity on the walls of many of Łódź's buildings and walls, rivalling what other cities like Berlin have to offer. 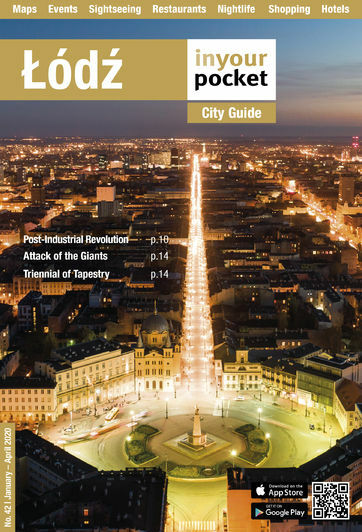 Indeed, Łódź is increasingly being recognised as one of Europe's little gems...which most people have never heard of! You're here at a good time, discovering a city still grappling with its recently acquired cool credentials, but still obscure enough to raise an eyebrow at the very mention of the name amongst international tourists? "Woo-what?" To date, Urban Forms has overseen the addition of about 80 murals over a decade. What's great is that street art is completely accessible to all, come rain or shine, on foot or by bike, what you choose to see, it's all just a matter of having the will to go and explore. From works of art that provide clear cut messages, to the more obscure works open to interpretation; regardless, they are an expression of an artist's creativity. There's plenty to see, and there will be more to come. We've reached 2018, and Urban Forms is celebrating its 10th anniversary (with the Urban Forms Festival, 22-29 July), so what have they achieved in this time? First off, you simply need to visit all the street art sights to see the full extent of the work – the answer is plainly painted on the walls! For as much as the city has regenerated itself through infrastructure projects, and fresh licks of paint here and there, it's the other type of paint, often the one from cans, which can be overlooked. The cultural diversity displayed on the streets of Łódź is vast and shows how a city can change its fortunes in such a short time to become one of positive change. 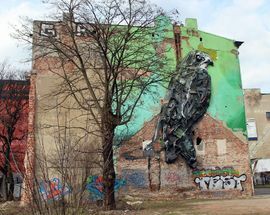 While Urban Forms has been a celebrated success, in other cities, such as Berlin, there is an ongoing debate about whether street art has been appropriated by authorities, another form of gentrification that counters the original intentions of the artists and purposes of the murals. Łódź has employed the talents of street artists to create public art in the service of the re-invigoration of the city, with quite an element of success as they have remembered two important factors of street art – to respect the work of the artist while adding value to a neighbourhood and the community of people that live there. Stick to this and we'll keep the beast of gentrification at bay with a big stick! At any rate, those with an interest in street art will have little trouble tracking it down in Łódź, and we’re making it even easier. We fully encourage you, especially in these warm months, to see as much of the murals, and street art installations, as you can. It's a pleasant adventure in itself as you inevitably get to see the city for yourself, including parts you would not otherwise have considered going. In addition to cataloguing and GPSing street art addresses throughout the city in our online street art section, we’ve also marked each location with a spray can symbol on the maps in the back of our guide, so you can literally use them to give yourself a tour of Łódź’s urban art. As for online, we've even listed all pieces of street art, old and new, to keep you informed if they still exist or not, to save you time from visiting a site, only to discover that once fantastic mural has been painted over, or worse, the building it was on is gone (if you find that piece has been painted over since we've last been, please, do let us know)! Wandering around the city you are also bound to stumble across some rather fine and less ‘in your face’ little creative acts. We particularly like the painted and stencilled gas and electricity boxes which are dotted around town. They are frequently changed and too many to mention, but keep your eyes peeled, you'll no doubt see plenty on your travels around Łódź. Happy Hunting. Created by Chinese artist DALeast in 2014 for the Urban Forms project. Created by DALeast (China) in 2015 for the Urban Forms project. 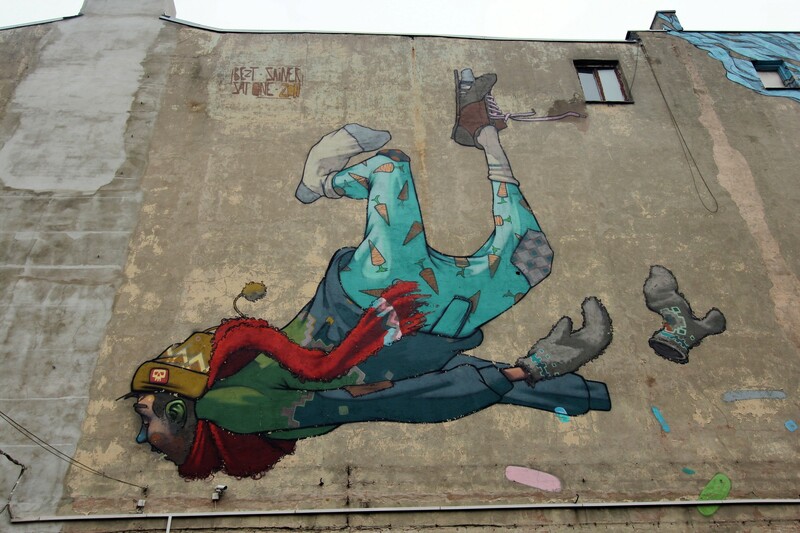 Created by Etam Cru & Robert Proch, found at the rear entrance to OFF Piotrkowska. Created by artist Lump in 2012 for the Urban Forms project. 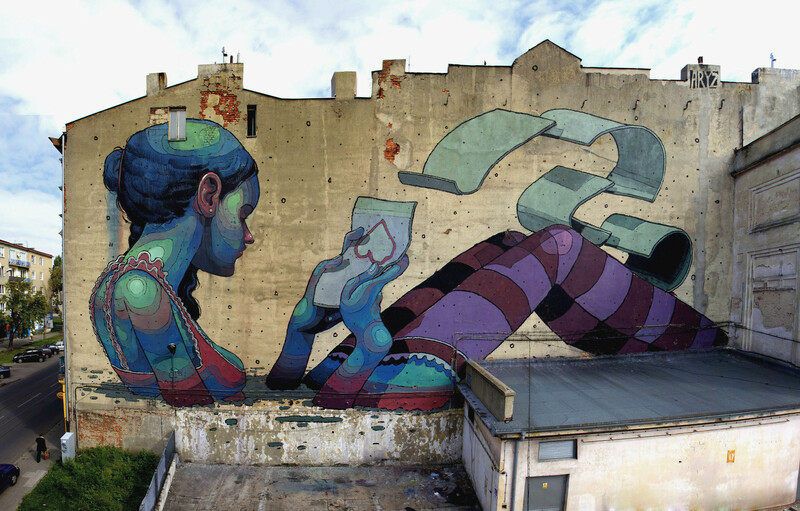 Mural by Spanish artist Kenor, created in 2011 for the Urban Forms project. 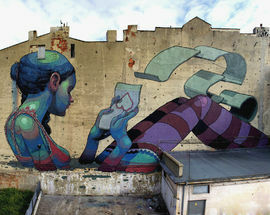 Created by the Etam Cru in 2012 for the Urban Forms project. Don't miss out on the other mural on the other side of the building by Spanish artist ARYZ. Created by Gdańsk artist M-City in 2015 for the Urban Forms project. Created by Gdańsk artist M-City for the Urban Forms project in 2012. Created by Russian artist Morik in 2014 as part of the Urban Forms project. Created by Belgian artist ROA in 2013 for the Urban Forms project. Created by artist Sainer in 2012 as part of Urban Forms project. Sentir (2015) is the creation of Puerto Rican artist Alexis Diaz as part of the Urban Forms project. 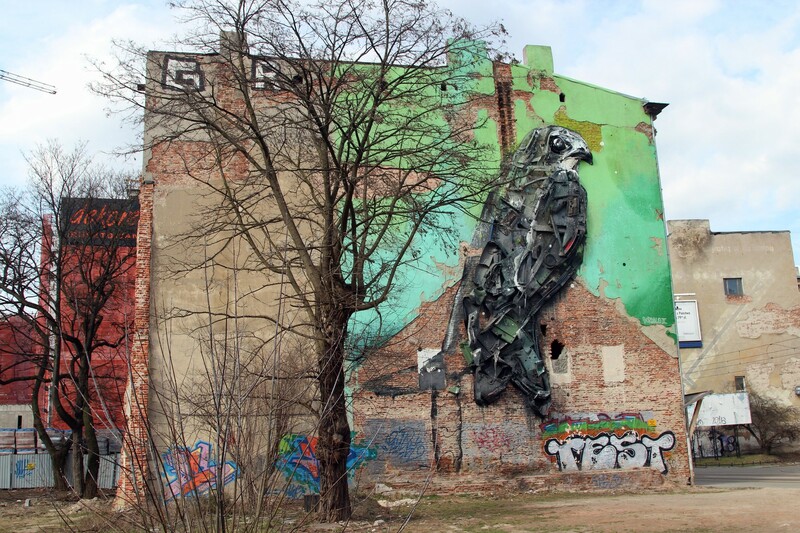 Polish artists Michael "Sepe" Wręga and Daniel "Chazme" Kalinowski created this piece as part Urban Forms project in 2011.